Lychee liqueur cocktails add an exotic twist suitable for nearly any occasion. If you are looking for a unique mix that serves as a topic of conversation as well as a refreshing drink, cocktails using this subtropical fruit are excellent choices. A lychee is a small fruit that originated in South China and is grown commercially in warmer climates. The fruit is roughly two inches in size and may have a heart or oval shape. 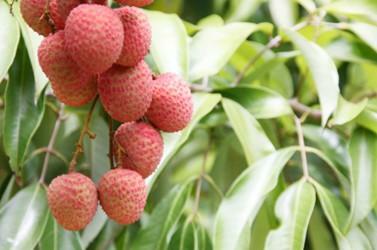 Sometimes referred to as a lychee nut, the fruit's exterior is bumpy and has a rich red hue. Beneath the skin, its translucent interior may be pink or white in color, and it has a texture that is similar to a grape's flesh. The fruit is a great choice for adding unusual flavor to cocktails because it boasts a crisp taste that must be experienced to fully appreciate. The balance between acidity and sweetness, along with hints of rosy fragrance, is unique and makes the label "King of Fruits" applicable to the gem-like food. Lychee cocktails may include the fruit itself, its juice or a liqueur flavored with the berry. Liqueurs containing lychee generally contain a relatively low percentage of alcohol, at roughly 21 percent, or 42 proof. Many people enjoy drinking the liquors neat because of their light taste, absence of alcohol burn and well-balanced sweetness that doesn't overwhelm the palette. Lichido Liqueur, a fascinating combination of cognac, vodka and exotic fruits including lychee, white peach and guava. This unusual liqueur stands well on its own, but it may be blended with other ingredients. Lychee liqueur cocktails may be very simple, or they can be complex depending on the recipe you choose. The relatively low alcohol content and smooth texture that the liqueurs have make them excellent choices for adding unusual flavor without overwhelming the drink. The fruit's sweet taste balanced with crisp acidic undertones is naturally appealing without being too syrupy. The fruit is revered as a romantic element, perhaps because of its exotic nature, rich red color and its rounded heart shape. The rose petal undertones that some of the liqueurs have make the ingredient a wonderful match for sparkling wine or champagne. Mint is a lovely choice that adds interest to a simple champagne cocktail using one part lychee liquor. Depending on personal taste, you may choose to crush a few mint leaves or add a half shot of Mint Schnapps to the cocktail. Next, add the liqueur and sparkling wine or champagne. Garnish your drink with mint leaves. The subtropical fruit is also a great choice for mixing with rum, and some Daiquiri recipes can be spruced up with a shot of lychee liquor. To make this drink, add one ounce of dark rum to an ounce of lychee liquer and a quarter shot of cherry brandy. The combination may be blended with ice in a blender with sweet and sour mix and simple syrup, but some people prefer to add lemon-lime soda. Garnish with a maraschino cherry, adding a dash of cherry syrup for added color and flavor if you like. No list of lychee cocktails would be complete without a martini recipe. Pour three ounces of premium vodka and one ounce of lychee liqueur in a shaker and shake well to infuse the flavors. The simple recipe may be served over ice or strained into a martini glass and garnished with a pitted lychee fruit or a twist of lemon. Experimenting with unusual flavors can be very rewarding. Lychee liqueur cocktails are interesting choices whether you're using fine vodka, rum or sparkling wine. There are basically endless possibilities to consider.